We know from verse 42 that “evening approached”. According to Jewish time keeping, the Sabbath started at 6pm, when all work was not allowed, hence the urgency to get Jesus body into a tomb. I have set this scene at about 5:30pm. 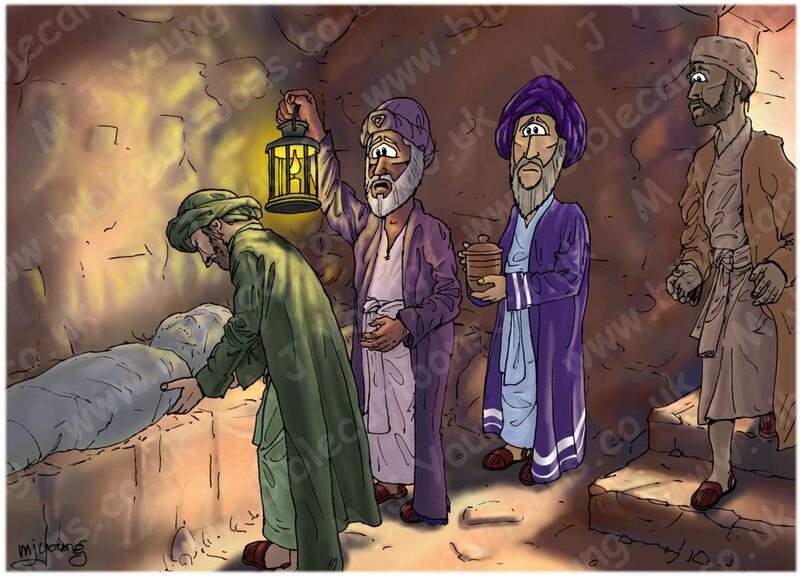 The primary source of light in the tomb is from the lantern held by Joseph from Arimathea (in purple). That throws yellow light, & casts strong shadows into the scene. The setting sun (unseen, outside, on the right) is bathing the entrance to the tomb (just visible behind the man on the right) in weak orange/red light. The setting suns glow can also be seen on the floor & walls of the tomb. From left to right: Jesus (laid on a stone shelf in the tomb) a servant (in green), Joseph of Arimathea (in purple) holding a lantern up, Nicodemus holding a jar. Another servant is coming down the stone steps into the tomb. There is a third unseen sevant carrying Jesus’ feet, out of view on the left of the scene. John – son of Zebedee, Mary (the mother of James the younger/less and of Joseph/Joses) (see verse 40), Mary Magdalene and Salome who have been in previous scenes, are not visible in this particular one. There are two versions of this scene, this one (the Light version) & the alternate (the Dark version) which is on the previous page. In this Light version I have reduced the dark shadows on the figures, & lightened up the wall colours, to make it easier to see the scene. In the previous scene (the Dark version) I have concentrated on creating moody, deeply shadowed limestone rock colours, with blue & violet shadows. I did this to indicate the failing light, as the sun goes down, & the dim light within the tomb. Although lower light levels (as dusk approaches) tends to reduce tonal contrasts, I wanted sharper, stronger shadows on the figures, cast by the yellow light of the candle in the lantern. I have included both versions to cater for different customer needs: some people like darker, more atmospheric scenes, whilst others might want to see all the figures more easily. For comments & notes regarding some possible locations for the burial site of Jesus, see the previous scene: Mark 15 – Burial of Jesus – Scene 03 – Into the tomb (either version). Tomb interior (Light version), without the figures. 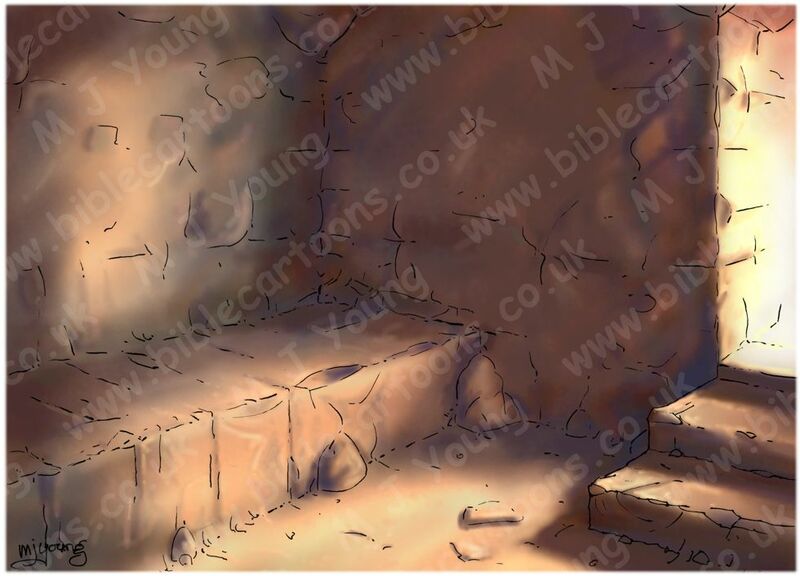 I’ve included this picture, so you can see the rock tomb scene without the figures.